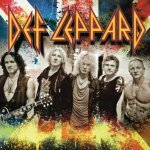 Def Leppard played a show in Santiago de Compostela, Spain on 28th June and a third online review and photos have been posted. The Box FM have posted a review of the show which took place at the Fontes Do Sar venue. 4 photos are included with the review. "In total, nearly five hours of rock , Much of which originated between 1986 and 1987. Time has treated unequally to the repertoire of the three groups, as well as their members, but they are all part of the brief rule of rock in the 1980s. The general feeling was unanimous one great show, yes sir!."